If you want a chance at winning a $50 American Express Gift Card, tune in every Saturday during The Rockin’ Pop Party, from 4:00pm to 7:00pm Eastern on Sky 106 through the month of August. Each week, you’ll learn how to qualify to get your name entered in the giveaway. On Saturday, August 29th, 2015, a winner will be randomly selected and will receive the gift card by mail, with no strings attached! Every week there is a different way to qualify to be entered in the giveaway. It is not going to be revealed beforehand, so listening to the entire show is the only way to guarantee your entrance each week. Some weeks, it may be necessary to listen to other shows on Sky 106 to fully understand how to qualify. When you’ve listened to that said show(s) mentioned on The Rockin’ Pop Party, you’ll then understand how to be entered in the giveaway. This giveaway, because it is independent of Sky 106 or any contests that this station may be giving away means that anyone can qualify, but the above statements still apply. You can qualify to enter up to 10 times, therefore bettering your odds to win the gift card, but to be fair, those at Sky 106 can only qualify once. This will provide an advantage to the listeners, since it’s orientated that way. Any conversation whether written or verbal may be recorded, but will only be used for promotional, personal records or verification purposes only, unless expressed otherwise, and only upon the consent of the recipient. The very minimum requirement to be entered in the giveaway is an email address. However, a phone number of any kind may be necessary for certain occasions to qualify during special circumstances. The winner will be contacted when the event is over, at which point a shipping address will be needed to deliver the gift card. For all legal and binding agreement purposes, you must be at least 18 years of age to qualify. Anyone under the age of 18 must have consent by a legal guardian. 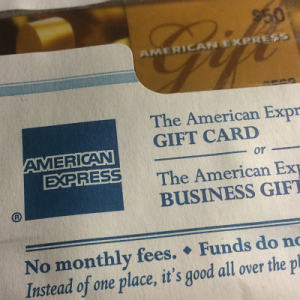 The $50 American Express Gift Card can only be used with U.S. merchants, and the currency is in USD. For more information, please feel free to contact me with any questions you may have regarding this giveaway.